Sam Z has lost a lot: Money, jobs, his mind, at times his dignity. Where did it all go? What happened in the 10 years it took him to spend every cent of the tiny fortune his family left him? 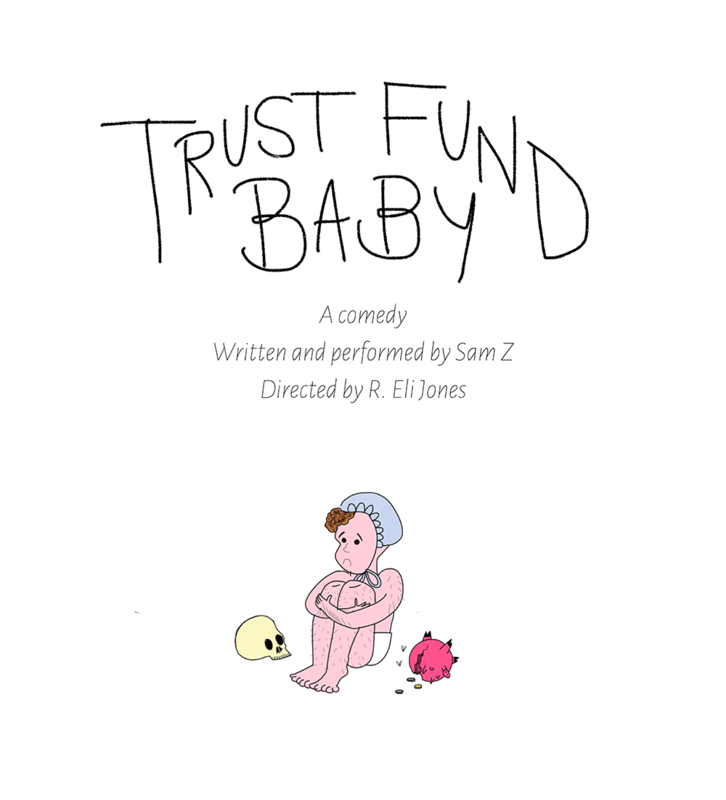 In his debut solo comedy, writer and comedian Sam Z follows the money to try and make sense of what’s left. Sam Z (writer and performer) is a riddle wrapped in an enigma inside a purple tuxedo. He grew up in a small town in Massachusetts, writing and directing his first full-length comedy at 16, graduated early from Brandeis and flew to Chicago spending four years studying improv and the art of medieval clowning. He now lives in Brooklyn, an emerging standup comedy voice, managing the blog for a music app during the daytime. His monthly open mic at Pete’s Candy Store has fast become a staple in the community, and his show Comedy Quarterly often features faces from television. The Chicago Tribune once declared him a latter-day Buster Keaton for his surrealistic deadpan. He will shock and inspire you. R. Eli Jones (director) is an artist, writer, and craftsperson living in New York. After eight years traveling across the country working in the trades as a cabinet maker, construction worker, guitar maker, farmer, and educator, she achieved an MFA in craft and design. She is currently the lead woodshop technician at Parsons School of Design where she has mentored hundreds of students. Her writing and artwork has been featured in shows across the US, in Parsons publications, and online. Her woodworking lives in dozens of homes throughout New York City. Her debut solo exhibition Garden detritus is currently showing @Wire_Gallery.